Summer is almost here, and the good times are about to roll on family vacations. Although you anticipate a relaxing time at your destination, the thought of traveling with a baby or toddler may send a shiver up your spine. But try not to fret about the journey and instead prepare yourself with these great tips on flying cross-country (or any distance!) with young children. We’ll let you in on a little secret, finger puppets are a real lifesaver when you’re trying to keep your baby or toddler entertained and quiet! This sweet, handmade tic-tac-toe game is also a good way to keep a toddler engaged. And you can minimize your carbon footprint while away from home with these 6 tips for staying green while traveling with your kids. We all know that kids = stuff, and lots of it. 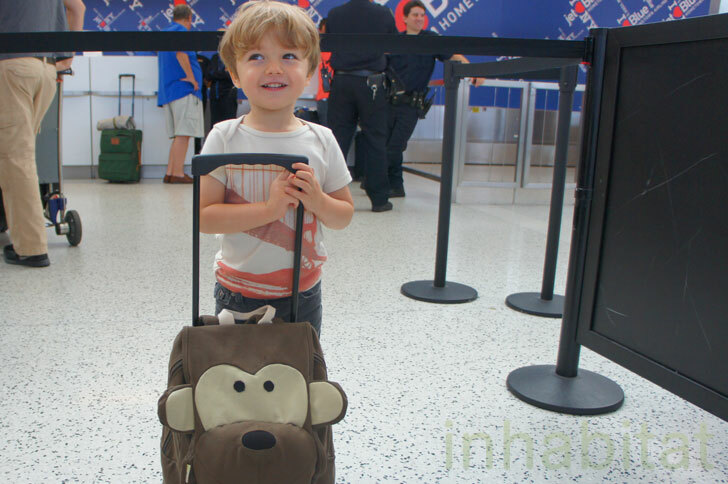 Let them tote some of their own belongings in a cute suitcase for little jetsetters and their toys. And stock your diaper bag with these essential summer accessories. Being prepared for spills and accidents of the wet variety while on-the-go is key to maintaining sanity! Load your travel bag with some Wet Happened? bags to take these incidents in stride. You can also tend to boo-boos and ailments by popping this wonderful apothecary kit into your diaper bag. Is your family beach bound for vacation? If you’re able to load up with your own gear, here are our top picks of eco-friendly toys and must-haves for the beach or the swimming pool. Don’t forget, baby will need a swim diaper! We love Bummis reusable swimmi diapers. These adorable terry cloth cover-ups will keep babies and kids dry after swimming in the ocean or pool. And just because you’re en route doesn’t mean that endless snacks and meals won’t still be part of your daily routine. Take along this corn based feeding gear so you’ll always be prepared to feed your little one. Baby will appreciate having a comfortable, familiar place to cozy up and go to sleep after a day of adventure, so check out this sweet organic baby bed that you can tote with you for naps and bedtime.